The Sears 1964 catalogs were a bit of a door chime renaissance at Sears. The Fall 1964 Big-Book devoted an entire page—more catalog space than ever before—to doorbells, door chimes and buzzers. For the first time ever, Sears offered a fully featured multi-note long bell chime with a clock. This model, marketed as the Rittenhouse Colonial-Style Master Chime provided Sears with a direct competitor to Nutone’s highly successful top-of-the-line “Jefferson” clock chime. Doorbells with integrated clocks made their first Big-Book appearance in 1964. The 1964 catalog included the innovative Rittenhouse Prelude door and dinner chime. The Prelude played a four or eight note melody to announce visitors, and included a mallet for striking a tune on the polished tone bars to summon the family for dinner. 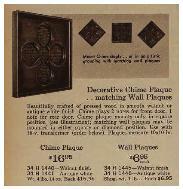 That same year, door chimes were even marketed as the centerpiece of wall decor with matching Decorative Plaques. Billed as the latet in “Smart Door Chimes”, the fashion was short lived. You had to earn your keep quickly in order to stay in the Big Book as the Prelude was gone by 1965. The Colonial soldiered on through the Fall of 1967. The Rittenhouse brand was eliminated from the Catalog in the Fall of 1968, and Sears sold doorbells entirely unbranded. 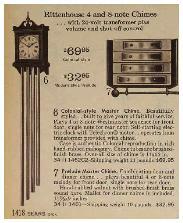 The 1968 Summer Catalog introduced two simply styled “Clock Chime Combinations” manufactured by Rittenhouse. This was the last real door chime catalog marketing effort from Sears until 1977. Since the 1940s, many doorchimes included clocks. The more elaborate models mimicked the look of Grandfather or Tall Case clocks.A few of these chimed the hours. 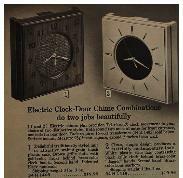 Smaller electric clocks with integrated doorbells were marketed for kitchen installations.